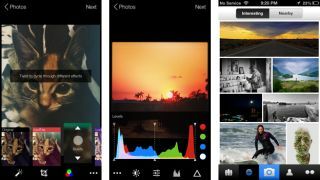 Yahoo today outed a new version of the Flickr for iPhone app, which allows users to preview how each filter will look within their shooting environment before they take the photo. The updated app introduces a live filter previews, a feature that was once popular with Instagram users before the Facebook-owned company canned it in an update last year. Beyond that, the major update also gives snappers the opportunity to express their creativity beyond the range of stock filters, with additional effects like vignettes, bursts and focus shifts. iPhone photographers can now also access a pretty varied array of editing tools allowing for crops, tilts, rotation and flips, while also adjusting colour levels, brightness, sharpness, white balance and more. All in all, the new app is a pretty comprehensive shooting and editing package, completely free of charge. It also arrives as one of the fist major apps to boast a new, iOS 7-inspired design and user interface. The new features make it possible for more advanced photographers to fine tune their snaps, while 'point-shoot-filter' iPhone wielders won't find the depth of options too obtrusive. So far the updates are only for Flickr's iPhone app and as yet there's no word on when the Android app will catch up, but it's unlikely to be too long. The company has launched a big redesign to its website and given all users 1TB of free space earlier this year, so this latest iOS app update is a sure sign the company has its sights set on the top again. Can the former king of photography on the web regain its throne under the stewardship of Marissa Meyer's refocussed Yahoo? Give the app a try and let us know your thoughts in the comments section below.